UAM can simultaneously protect two hazardous areas. Measurement data can be acquired via Ethernet with status of input/output signals and cyclic redundancy check code. Also supports command in SCIP2.0 protocol. Maximum 4 units of UAM can be interconnected for Master-Slave operation when muliple units are required to guard the hazardous area. 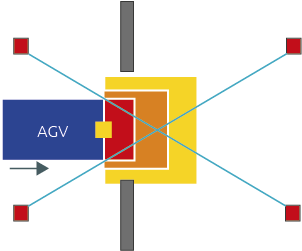 In AGV applications, area is switched depending on the vehicle's speed. The two Muting inputs allow two photocells to be connected in order to preserve the access safety, leaving at the same time free access to the designated AGV. Configuration data can be saved in a SD card which in turn can be used for configuring the UAM without connecting it to a PC.